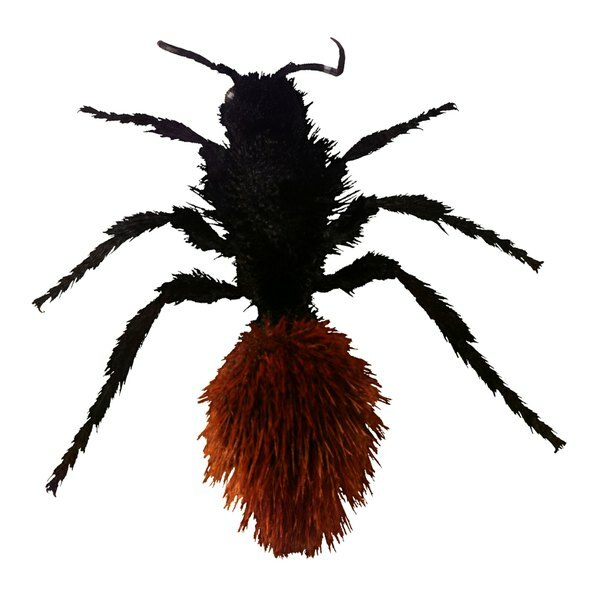 With ominous nicknames such as "cow killer" and "mule killer," the red velvet ant can inspire a fear that appears to be out of proportion to the insect's actual potential to do harm. Clemson University professor emeritus Don Manley has spent more than 20 years studying insects such as the red velvet ant, and he states that he has "not found an instance of a red velvet ant's sting being responsible for the death of an animal of any kind." Nevertheless, the red velvet ant is an intriguing species with a sting that is excruciatingly painful for its victims. Velvet ants, including the red velvet ant, are actually a species of wasp (Dasymutilla magnifica) rather than a true ant. Males have wings and are incapable of stinging. The brightly colored, intimidating female red velvet ants move by crawling on the ground, just like ants. The body structure of the red velvet ant is also similar to that of true ants. Patches of black and orange-red hairs give the female its dramatic appearance. Red velvet ants inhabit fields, pastures and lawns in Texas, Oklahoma, the Southern states and New England, and are capable of making an audible squeaking sound when disturbed. The nickname "cow killer" or "mule killer" seems to come from the intensity of the red velvet ant's sting. Manley relates that, although it took more than 20 years of working with the non-aggressive insects to get stung, the sting was a painfully memorable experience that he intends never to repeat. The sting of the red velvet ant typically produces intense pain that can last up to half an hour. In Manley's case, the sting created a "knot" on his thumb that lasted almost a month. Although the red velvet ant's venom is neither lethal nor toxic to humans or any other mammal, there is a danger of a serious allergic reaction with any type of insect bite or sting. Symptoms of a serious reaction include wheezing and difficulty breathing, hives or an angry rash, emotional agitation, difficulty swallowing, rapid pulse, dizziness or extremely low blood pressure. If you are stung and any of these symptoms occur, seek medical attention immediately. Otherwise, you can treat the painful sting with cold compresses, baking soda paste and an antibiotic cream to help prevent infection. The best precaution against a red velvet ant sting is simple: wear shoes. The ants are diurnal, meaning that they are active during the daytime, but they tend to hide during the hottest part of the day. The red velvet ant is tough and hardy, and the only known control measure is to plant a lot of grass to discourage ground-nesting wasps and bees from creating underground nests.